A criminal investigation has begun into an oil spill in San Francisco Bay that has closed nearly two dozen beaches and left scores of birds dead. The US Coast Guard chief for the area said the crew of the ship that leaked the oil was being questioned. The Cosco Busan hit the Bay Bridge in fog last week, rupturing its fuel tank. Reports suggest the inquiry will focus on possible communications failings. Meanwhile, the Coast Guard has faced criticism over its response speed. California Governor Arnold Schwarzenegger declared a state of emergency on Friday to help the clean-up operation move faster. 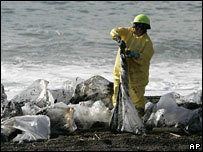 Some 58,000 gallons (219,500 litres) of fuel oil leaked into the bay after the accident last Wednesday. Democratic Senator Dianne Feinstein, a former mayor of San Francisco, expressed concern over an apparent lack of readiness and communications problems. "This is an incident which, in my view, should not have happened," she told a news conference on Sunday, after touring the affected area. "I think we can improve the system to manage shipping traffic in and out, in all kinds of weather conditions." The head of the US Coast Guard, Commandant Admiral Thad Allen, has defended his agency's response to the incident. He said any errors in how it handled the spill were "of omission, not commission". Nearly 60 ships and hundreds of people have been helping the clean-up operation, the US Coast Guard said. More than 12,000 gallons of oil had been recovered by the end of Sunday but miles of coastline have already been contaminated by the slick. The spill is said to be the largest to affect the San Francisco Bay area since 10,000 gallons of fuel leaked from a ship undergoing repairs in 1996.